Sometimes being on staff here at dadmarketing feels like you’re working as a detective, constantly looking for evidence. The odd thing, though, is that the evidence is relatively easy to find. It’s usually very compelling too, almost indisputable. Take for instance, the June 2014 American Baby magazine again. This issue is fast becoming a gold mine for dad exclusion, bearing resemblance to that of a major drug bust. We’ve only reached page 9, and find yet another classic dad-being-left-out advertisement. This time it’s Desitin, which is – surprise, surprise – one of the Johnson & Johnson family of consumer companies. If it seems like we’ve talked about J&J before on this site, we have. That drug bust connection makes perfect sense now, doesn’t it? Birds of a feather exclude dads together. Occasionally companies like this try to make good by not using the same message on their website, or by including some web photos of dads. Not Desitin. They trumpet where they stand on each parent even further by placing a “#1 with pediatricians and moms” logo smack on the front page of desitin.com, and a dad is nowhere to be found at the site. They even have the same slogan right on their product! 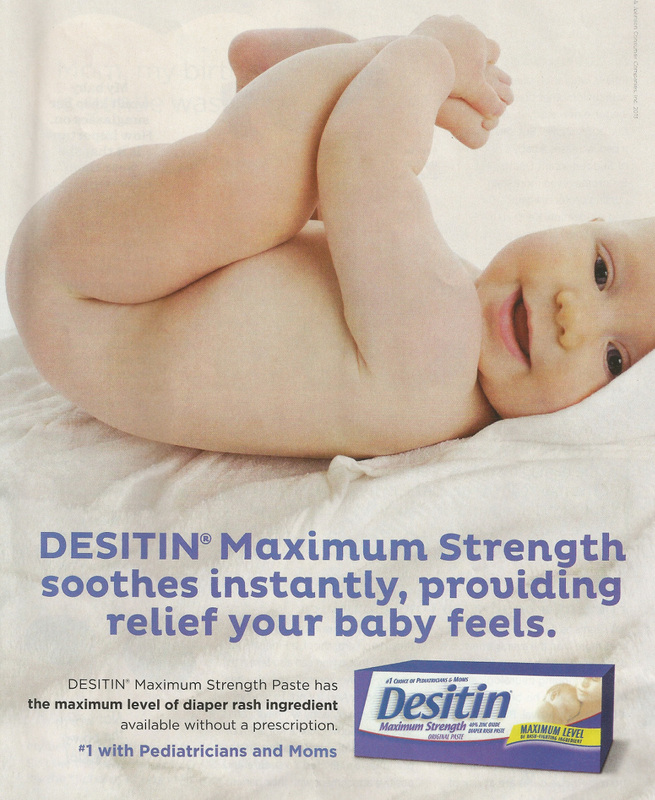 So even if you dads had done some online homework on diaper rash before your child was born, or you were reading American Baby magazine while waiting in the hospital, now Desitin has made sure you know you’ve been disregarded by the time you use their cream, because it’s printed right on their package. Say no to drugs, indeed. But Desitin isn’t far behind. Imagine for a moment, the thought of celebrating certain holidays every single day of the year. Halloween trick-or-treating would probably lose its thrill. Thanksgiving turkey would get a bit old. Christmas cheer would be a little less, um, cheery. But Father’s Day? I suspect most dads would wish for it 24/7/365. Who can blame them? Right now a dad somewhere in Maine is sleeping in. In Pennsylvania, two kids are serving daddy Lucky Charms, Pop Tarts and juice boxes in bed. In Michigan, a father and his daughters are going to the NASCAR race. In California, a dad and his dad are going out to eat. In Arizona, a group of dads are playing golf. In Nebraska, it’s pizza, ice cream and a bike ride for pops and the family. That’s the beauty of this holiday. There’s no one way to celebrate it. Sometimes families make plans together, but many times it’s up to the dad – a day to call his own shots and do whatever he wants. There’s no expected traditions and expectations, only the ones you set. 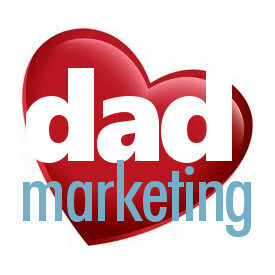 It’s nice to see one day a year dedicated to dads, but we here at dadmarketing think it should be year round. There have been plenty of store ads on TV this week devoted to dads. We’ve seen numerous media stories about more stay-at-home dads, or how dads help out more, or how dads have a big influence on lives. Let’s celebrate the spirit of this day every day, not just once a year! Let’s see it in advertisements and as part of long-term marketing plans. Let’s see brands embrace dads in everything they do. But all you businesses can start thinking about that tomorrow. Today, give the dad in your life some recognition. 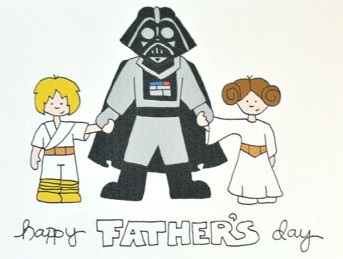 If you make it all about the dad today, though, you’re missing the point. Be sure to acknowledge the kids too, who made them dads in the first place. Without them, there’s no Father’s Day. And don’t forget moms, too, who make dads better men through their support and love. You know who you are, and we salute you! Enjoy this day! We’re all in full summer mode, and that means spending more time outdoors. More time outdoors means we’re spending more time in the sun. More time in the sun means we’ll need sun protection. As we do that, we reach for a brand we know and trust: Coppertone. Although it wasn’t a permanent fix at the time, at least Coppertone’s ancestors had the decency to lessen the nuances by replacing the Indian with the girl. Eventually, the slogan was eliminated altogether, and even her “paleface” and bare bottom disappeared, too. 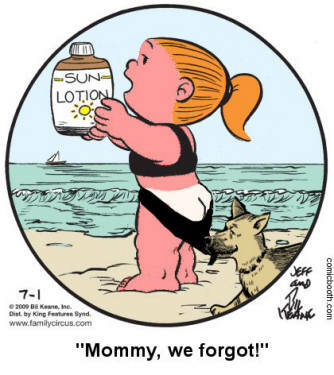 In later years, the Coppertone girl has been imitated, cartooned and parodied. And somewhere along the way, I suspect someone – probably another pharmacist – realized darkening a tan isn’t the best thing for your health, so they developed a popular line of sunscreens to protect us. 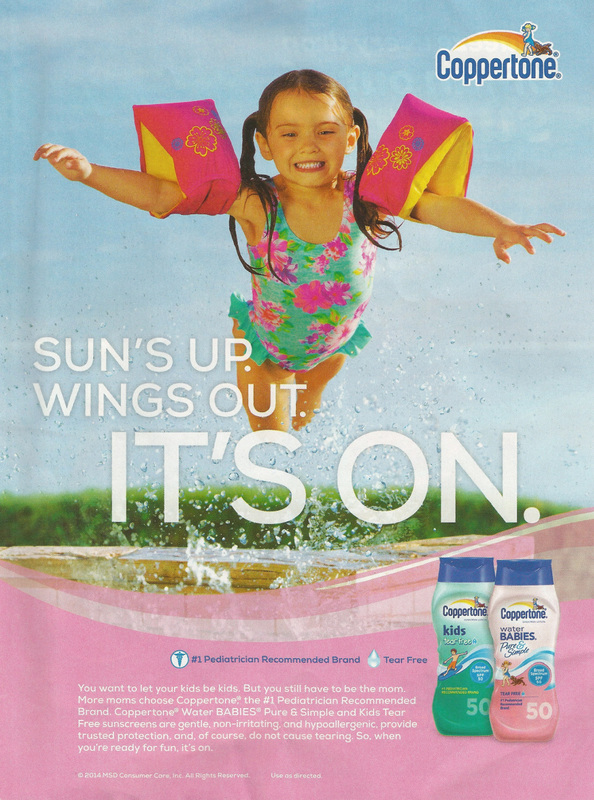 Coppertone was even named the #1 pediatrician recommended brand. All seemed well in the slather-iffic world of Coppertone until their highly paid marketing geniuses decided to run an ad in the June 2014 American Baby magazine, and then let it fall into the hands of the dadmarketing headquarters. Yep, if it weren’t for moms, kids would be dying of skin cancer everywhere because dads won’t do it; they’re lazy. That’s exactly the message Coppertone is sending, isn’t it? But don’t take dadmarketing’s word for it, the rest of the world thinks dads are lazy, too. 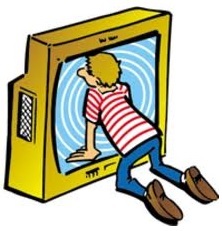 Go to Google Images and search “lazy.” You’ll find incessant pictures of men sleeping on couches, or watching TV. But then again, so does halfhearted, outdated, behind-the-times ad copy. Now that’s what I call lazy. If you abuse your power, do you have too much? Who most influences your behavior and opinions? Your parents? Your siblings? Your pastor? Wrong on all three counts. And wrong on anything else you might think is the answer. It’s the news media. The media has a power so strong they travel on the same plane as the President. It shapes much of public perception, and with smart phones, blogs and social media, nearly anyone can become an instrument for and with the media. You might not agree, but Donald Sterling does. And so do plenty of others. Any PR firm will tell you that when utilized correctly, the power of the media can be a most valuable ally. When handled carelessly, it can be dangerous and harmful to one’s image. But just because the new media is all-powerful, doesn’t mean it’s all-perfect. In its most basic form, the media’s job is to report the news. However, more and more we witness the media injecting opinions into print stories, offering comments after reading the TV news script, and personal view sound bites that act as fillers in-between radio commercials. The Internet is responsible for much of this, where there is no time or page limit, allowing anyone to ramble on with whatever they want for as long as they want. There used to be separate news columns and opinion columns, but now you can hardly tell which is which. The lines have been blurred. The gray area is grayer. The muck is muckier. And now, what once was a factual reporting of events, has become a writing free-for-all where reporters can say and do whatever they want in the name of journalistic sovereignty. This article, in yesterday’s USA Today, was tarnished early on through the irresponsible use of “Mr. Mom” in the first paragraph. What’s more, the story could have been accompanied by a photo of a dad caring for children, or working in the home. Instead, the newspaper chose to use a photo of Michael Keaton from the film “Mr. Mom,” where he’s drying a child’s bottom on a public bathroom’s automatic hand dryer. All of this is unfortunate, because otherwise, the story was well done and interesting. Nevertheless, “Mr. Mom” is now three decades old, and the connotation falsely assumes that societal norms never change, leaving the reader lost at best, and offended at worst with this poor choice of association. The news media wouldn’t be so powerful if we would only consume it, not overindulge on it.